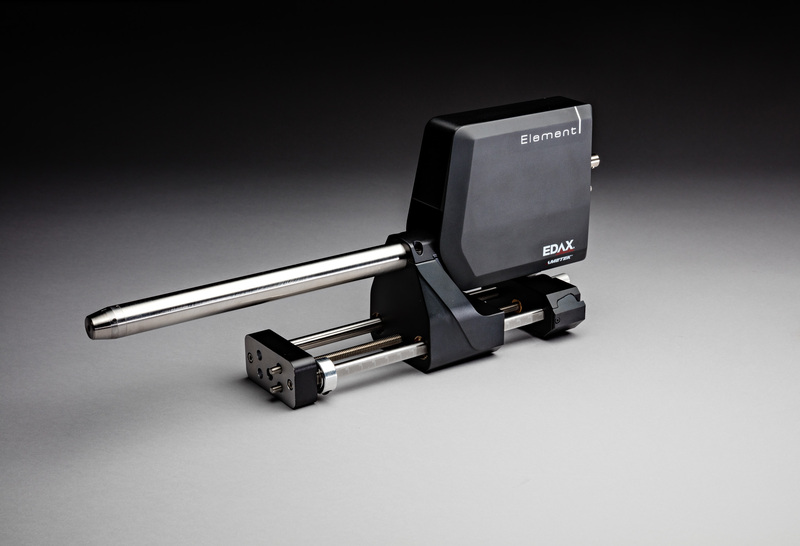 EDAX has introduced the new Octane Silicon Drift Detector (SDD) Series for its TEAM™ EDS Analysis Systems on electron microscopes. By incorporating the latest advancements in Silicon Drift Detector technology, the Octane SDD family delivers high-quality EDS data at previously unachievable speeds. Until now, the potential speed advantages of SDD technology have been unrealized due to losses in data quality at high count rates. With the Octane Series, customers are no longer forced to choose between fast data collection and high-quality results. They can now benefit from both to maximize their materials insight. 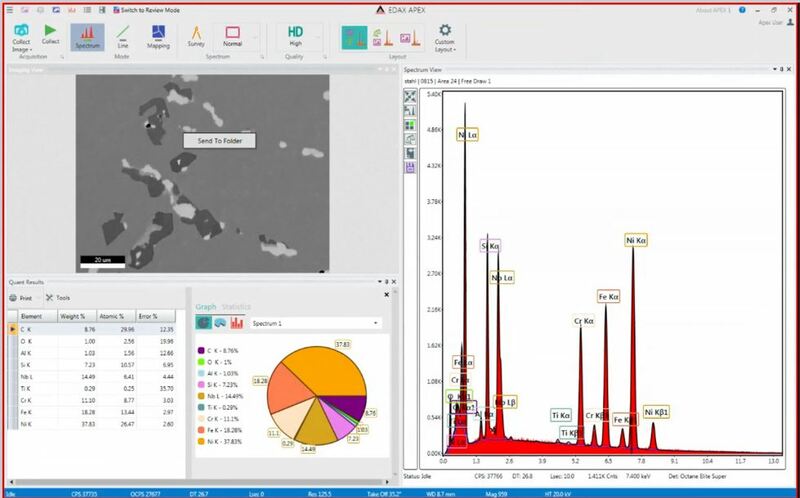 The Element EDS System blends powerful elemental analysis routines with an intuitive, easy to use interface that ensures ideal data collection, analysis, and reporting for users of all levels. The Octane Elect and Octane Elite EDS Systems process EDS data at previously unachievable speeds. Smart Features in the software streamline analysis and facilitate workflow, while optimizing data quality and helping EDAX users solve their characterization problems quickly and more efficiently. 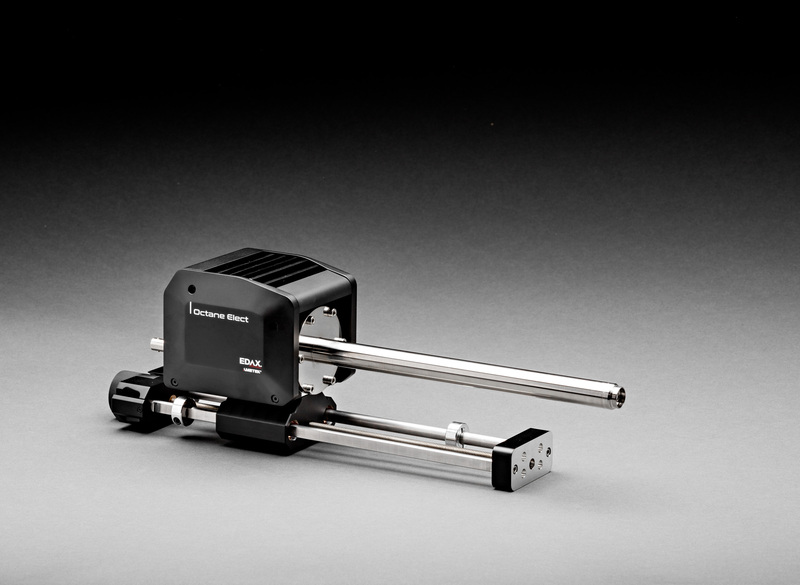 The Element Energy Dispersive Spectroscopy (EDS) System delivers powerful analytical capability in a compact package, maximizing performance and flexibility, while providing streamlined operation to guarantee fast results and ease of use. It is focused on the industrial market, where application specific problems need to be solved quickly and accurately. 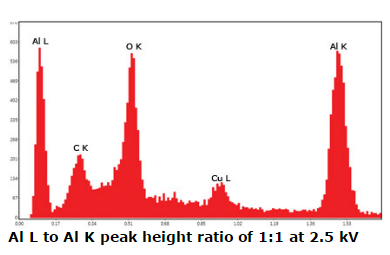 The combination of an Element Silicon Drift Detector (SDD) with the user friendly APEX™ software provides a complete EDS microanalysis solution for all levels of analysis and high throughput industrial applications. The Octane Elect SDDs incorporate a silicon nitride (Si3N4) window, high speed electronics and a manual slide. They can be combined with one of EDAX’s Electron Backscatter Diffraction (EBSD) cameras as part of the Pegasus EDS-EBSD Analysis System, providing seamless integration for both elemental composition and crystal structure analysis in one easy-to-use package. For more information, please visit the Pegasus EDS-EBSD Analysis System page. 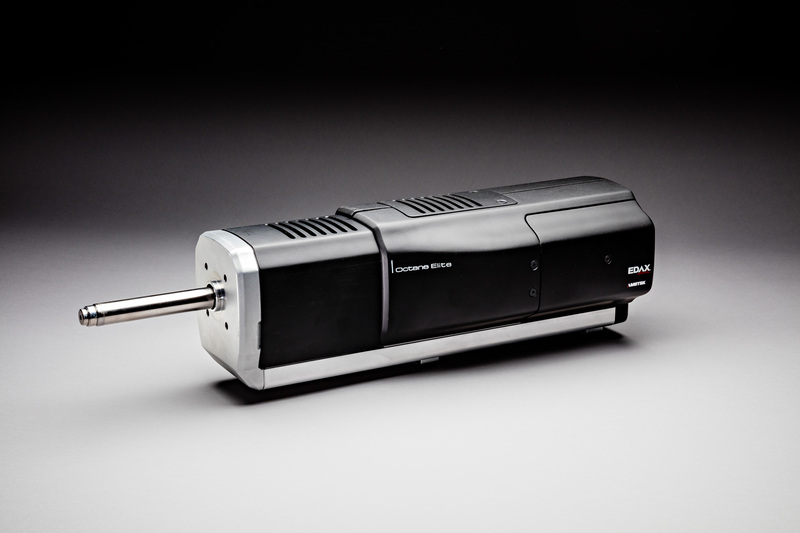 The game changing advancements in the Octane Elite EDS System with Octane Elite Silicon Drift Detector (SDDs) takes Energy Dispersive Spectroscopy (EDS) analysis to the next level. This system includes detectors which incorporate a silicon nitride (Si3N4) window, offering remarkable improvements in low energy sensitivity for light element detection and low kV microanalysis. The Octane Elite detectors also use technology, which yields high speed X-ray data processing within a smaller and fully vacuum encapsulated detector device. The Octane Elite SDDs incorporate a silicon nitride (Si3N4) window, high speed electronics and a motorized slide. They can be combined with one of EDAX’s Electron Backscatter Diffraction (EBSD) cameras and/or Wavelength Dispersive Spectrometry (WDS) detectors as part of the Pegasus EDS-EBSD Analysis System or Trident EDS-EBSD-WDS Analysis System for a complete materials characterization solution. For more information, please visit the Pegasus Analysis System and Trident Analysis System pages. The Octane Series delivers on the full promise of SDD technology – high quality EDS analysis performed at high count rates. 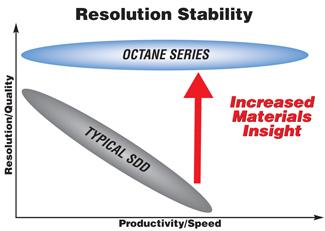 With industry best levels of resolution stability and detectors designed with key application needs in mind, the Octane SDDs offer increased materials insight to EDAX users and allow them to spend more time on materials discoveries.